In basketball, the story of a particular game is often written in the last five minutes of the game. When the game approaches those last five minutes, everybody forgets about the first 35 and a totally new game begins. During that five-minute game, everything you do has increased value. That’s when great players and teams are made. This season in the Turkish Airlines EuroLeague, like every other season, we have witnessed some amazing finishes, some of which determined the fates of teams and players. Think about how many titles in the history of this competition have been decided in the final moments, sometimes with the final shot? There was, of course, Victor Khryapa of CSKA Moscow‘s game-tying shot that forced overtime in the 2015-16 championship game; Fenerbahce Istanbul was a single rebound away from the title before reaching the ultimate goal the following season. And Georgios Printezis’s famous shot that lifted Olympiacos Piraeus to the 2012 crown in Istanbul occupies a beautiful place in the memories of many fans. To put it briefly, this competition always gives us unforgettable moments, whether you are supporting a specific team or not. At Eurohoops, we analyzed all the games from the 2017-18 season and uncovered the players and teams that handled the crucial moments at the top level in the best way. All statistics refer to each players’ performance in the last five minutes of regulation and/or of overtime. 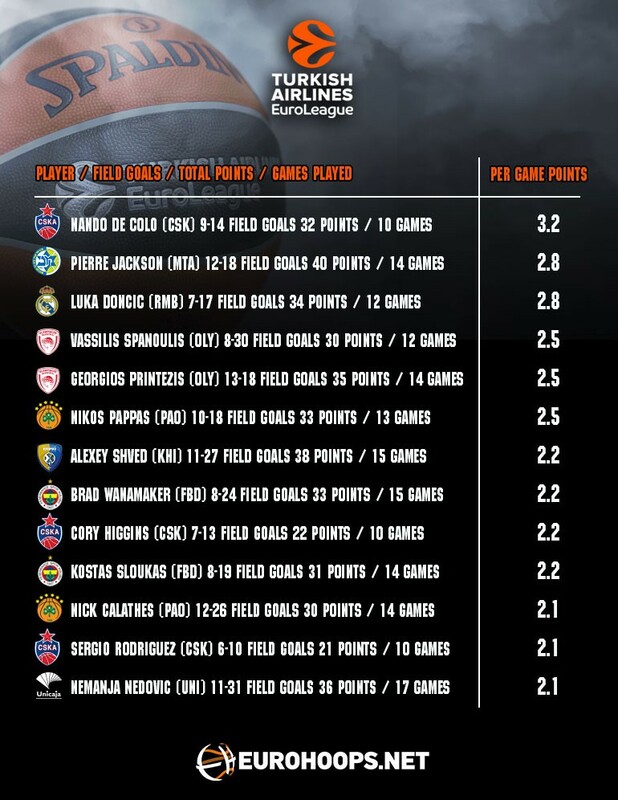 There are many great players in the EuroLeague and many of them lead their teams in crucial moments. In the list above we can see the players who took the most responsibility when it mattered the most. Nando De Colo has been one of the ultimate MVP candidates for years and once again this season he’s showing why that’s the case. The leader of the top-ranked team in the regular season belongs at the top of any such list. Fellow CSKA guard Sergio Rodriguez and Cory Higgins provide for their teammates in these moments as well. Considering that Vassilis Spanoulis and Georgios Printezis had key roles in Olympiacos‘s back-to-back EuroLeague championships, it is no surprise to see them playing and scoring in these moments. Reigning champion Fenerbahce also has two players on the list of most clutch players; Coach Zeljko Obradovic has been able to count on guards Brad Wanamaker and Kostas Sloukas to bring them victories in those final stages. Taking a look at Panathinaikos Superfoods Athens’s floor general and his performance throughout the season, it is crystal clear that Nick Calathes would be a basic member of our list. And as a lethal shooter, Nikos Pappas has helped the Greens win several games as well. Of course, you cannot underestimate Pierre Jackson’s second tenure in the EuroLeague, as he has shown glimpses of greatness. Who said Luka Doncic wouldn’t make this list too? We’ve already included Real Madrid’s 19-year-old golden boy, and even though he’s still a “work-in-progress,” Doncic is already one of the greatest players on the Old Continent.